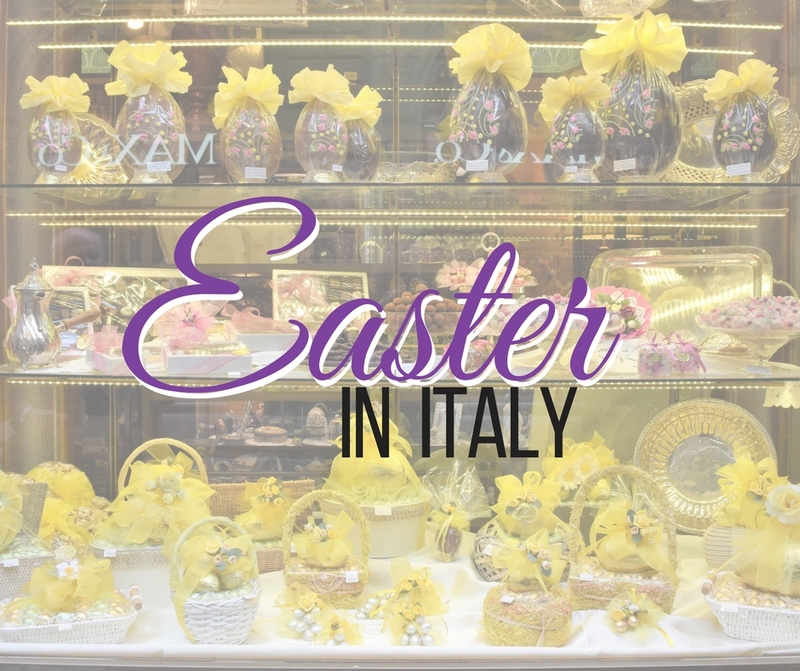 The tradition of Easter Sunday in Florence starts at The Church of Santi Apostoli. This Romanesque-style church located in Piazza del Limbo, in central Florence. 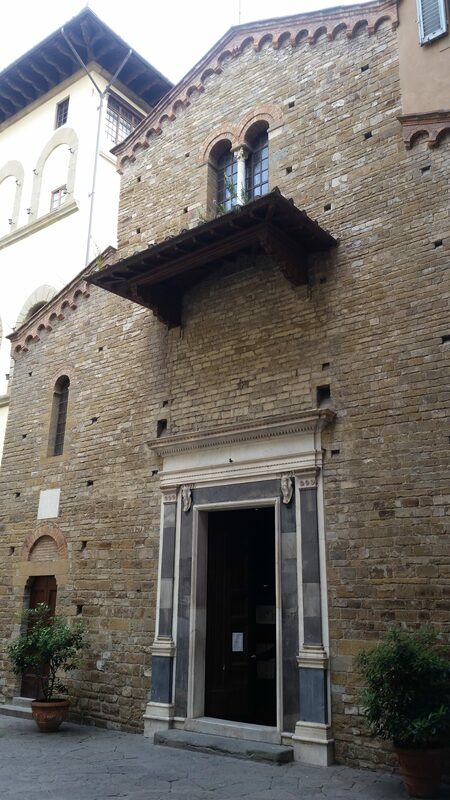 It is among the oldest church buildings in Florence. Legend has it that there is a cemetery underneath the cobblestones in the piazza where babies were buried. These babies died before they were baptized, hence the name of the piazza. 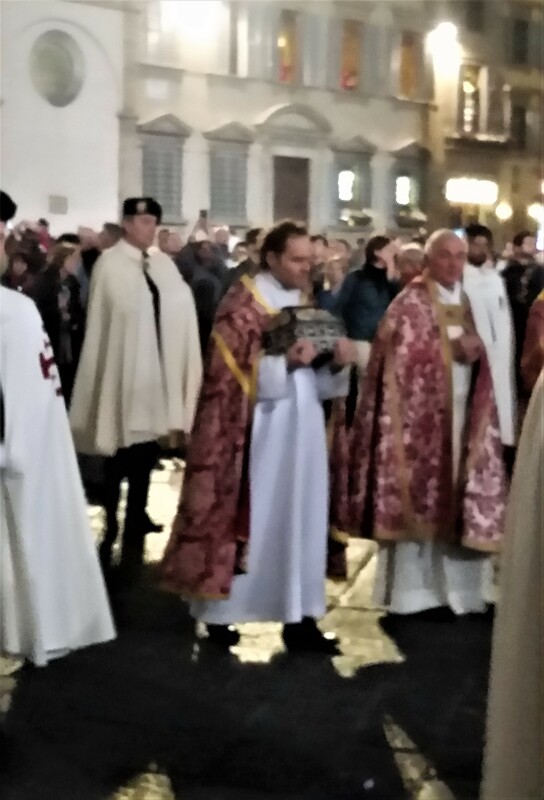 At 9:00pm on Holy Saturday the flints are taken from Santi Apostoli and brought to the Duomo. We were at the church and followed the parade/ceremony as it went through the streets of Florence with drums beating. 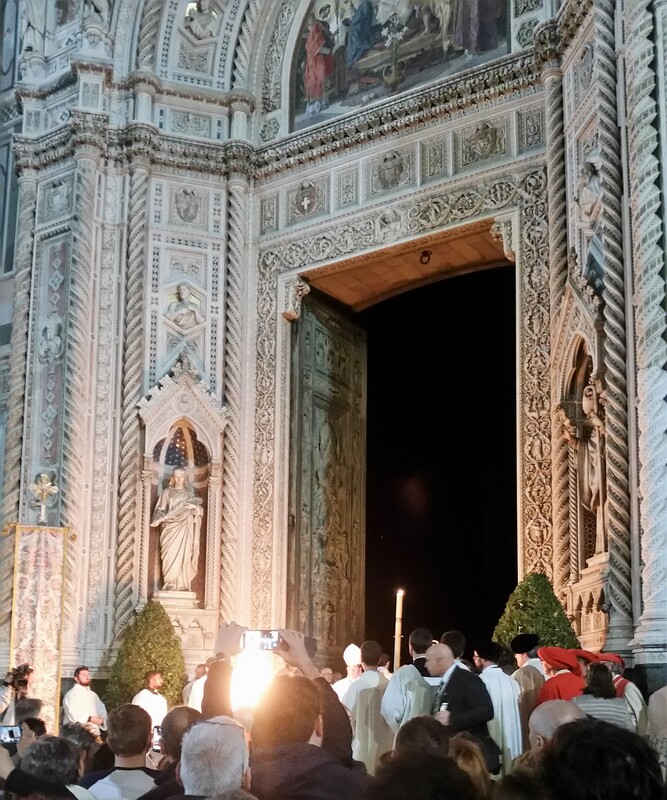 A bonfire is lit at the front doors of the Duomo and a candle that was also brought from the church is lit and will stay lit until tomorrow for Easter mass. 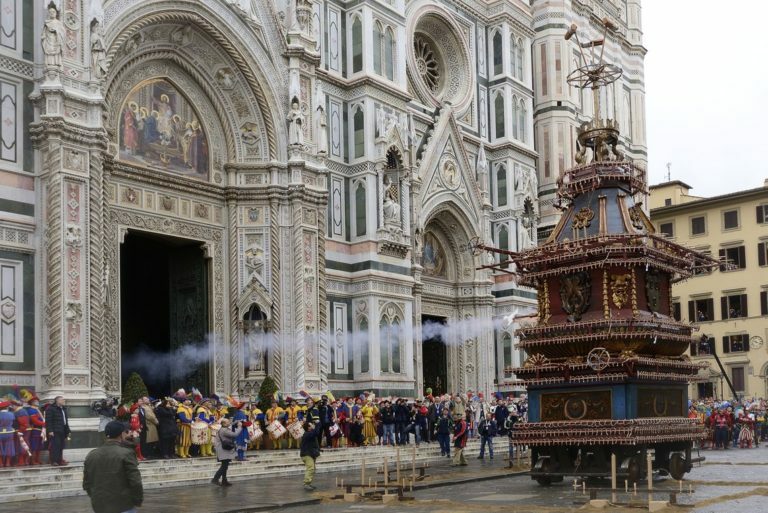 On Easter Sunday every year, Florence celebrates the religious holiday in a very spectacular way. The Scoppio del Carro, (Explosion of the Cart) dates back over 350 years. An elaborate wagon which was built in 1622, is pulled by a pair of oxen through the streets of Florence. It stops between the Baptistry and the Duomo. The cart is 30-feet tall and escorted by 150 soldiers, musicians, and people dressed in medieval wear. The cart, prepared with fireworks, awaits in front of the Duomo. 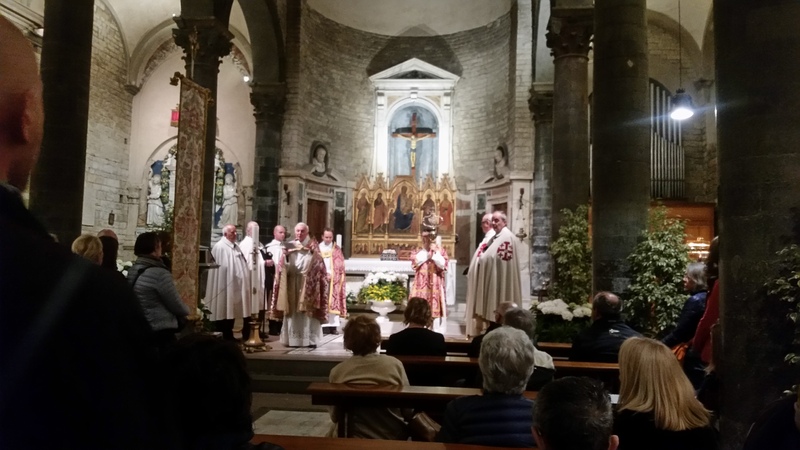 The Archbishop, when the “Gloria in Excelsis Deo” is being sung inside the church, uses the Paschal candle that was lit from the fire of the three flints to light the “Colombina.” The Colombina is a dove–shaped rocket symbolizing the Holy Spirit. The dove flies out of the church on a wire and collides with the cart in the square, setting off a spectacular firework display. The fireworks show lasts about 20-minutes. Finally, a successful display from the explosion is supposed to guarantee a good harvest, stable civic life, and good business. Italian Citizenship | Where Are We In The Process?